There is a misconception in industry that bearings should be lubricated like bushings. Many people are under the impression that if a little lubricant is good, a ton must be better. However, overlubing a bearing can cause the same or more catastrophic problems than underlubing. Although this practice is slowly being eradicated as its ineffectiveness becomes common knowledge, the old ways of overlubing continue to persist in some areas of our workplace. It is inherent in the millwright culture to want to see grease oozing out of bearings. We had oilers that would push 20 pumps into a bearing even if grease started spewing out after the first pump. During my training in the lubrication department, one of our more experienced oilers took me to a machine and told me to put in 10 pumps of grease every week. This machine is indoors in one of the cleanest areas of our mill, except for the big piles of grease directly below the bearings. As I put in the first pump, the same volume came spewing out of the sides of the bearing. On another occasion when I was an apprentice millwright, a journeyman told me I had to be their “human Q-tip” to go through all the excess grease that had been dumped out of the bearings via overlubrication. Being new, I hesitantly opened the access panel to find calf-deep sludge made up of grease and bark dust. Luckily, he was joking, and I didn’t need to crawl in. Unfortunately, this took overlubrication to a whole new extreme. This was common practice. It was normal to see puddles of grease. If I came across a place where there wasn’t grease oozing out of the bearings, I knew I had better find an oiler to add a little more grease. We experienced regular bearing failures that were associated with a lack of lubrication. Everyone knows the old saying that hindsight is 20-20. Well, now we know that lubrication was a factor in all these failed bearings, but more appropriately they were a consequence of our overlubrication culture. After going through Noria’s Machinery Lubrication training, it became apparent that we had an opportunity for improvement in this area. Our new and improved predictive maintenance (PdM) department started cleaning up this practice. We did calculations for specific bearings and started to properly lube our machinery. At first, maintenance personnel were indignant, thinking that since grease wasn’t oozing out, the bearings were not being lubed. I had to explain that the bearings were finally being lubricated properly. Thanks to SKF and its simplified formula, you can easily calculate the volume of grease needed by multiplying the bore diameter by the bearing width and a constant of 0.114. If you can safely reach the bearing, you can measure it, but most of the time our access was drastically restricted. When this was the case, I would look up the bearing dimensions online. Once we had our measurements and figured out the calculation, we were in the ballpark for how much grease to put in the bearing. For example, let’s say a bearing requires 1 ounce of grease. What is an ounce of grease? One pump? Ten pumps? Who knows? Even if the grease gun is rated for a certain amount, it is not always accurate. Therefore, it is imperative to calibrate all grease-dispensing equipment at your facility. Use a kitchen or postal scale to determine the weight in ounces per stroke of each grease gun. You can find quality scales for less than $15. At our facility, one of our maintenance coordinators borrowed his wife’s kitchen scale for us to use. I highly recommend you refrain from stealing your wife’s scale and instead buy one specifically for this purpose. At our plant, we line the scale with a rag, zero it out, then squirt 20 pumps of grease onto the scale and divide the total weight by 20 to get an average. We then label each gun with the average volume per stroke. That way the delivery means our technicians use doesn’t matter. We can still ensure the bearing is receiving the proper volume of grease. Knowing the quantity of grease the bearing needs, we can calculate how many pumps it will take based on the gun’s average output per pump. We also utilize battery-powered grease guns with a digital readout. These are calibrated with the same method. Our next obstacle was determining how often to apply this amount of grease. There are multiple tables, charts and calculators for establishing the proper frequency. The major factors in determining relubrication frequency are load, operation time, type of bearing, speed, temperature and environment. Keeping these factors in mind, the formula we use is: T = K x [(14,000,000/n x (d0.5)) – 4 x d], where T = the time (in hours) until the next relubrication, K = the product of all the correction factors, n = speed (revolutions per minute), and d = the bore diameter (in millimeters). The correction factors account for temperature, moisture, contamination, vibration, position and bearing design. Fortunately, most of our equipment runs at about the same speed, temperature and vibration. We also use very similar bearing designs. This leaves us accounting for moisture, contamination and position. It is astonishing to see how small changes can affect the time between regreasing. For instance, mounting a bearing at a 45-degree angle or with temperatures of more than 150 degrees F will cut the interval in half. At our mill, contamination and moisture are the greatest challenges after installation. We use the same style of bearing in a variety of applications. One is indoors but contends with some light abrasive debris. Another is outside and battles moisture and heavily abrasive debris. Under ideal conditions, this type of bearing would need just more than an ounce of grease every 2,828 hours. However, since it sees light abrasive dust, we need to adjust the correction factors. This slow-moving bearing has a speed of 120 revolutions per minute with a 74.6125-millimeter bore diameter. Based on the correction factors, which are represented in the equation as K, the interval should be reduced to 1,131 hours. If water is introduced into the equation with heavily abrasive dust and the correction factors are adjusted accordingly, the relubrication time drops to 56 hours. Thus, even though it is the same bearing, you cannot make a blanket statement that it requires the same amount of grease. From this example, it is easy to see why some people think bearings need lots of grease. 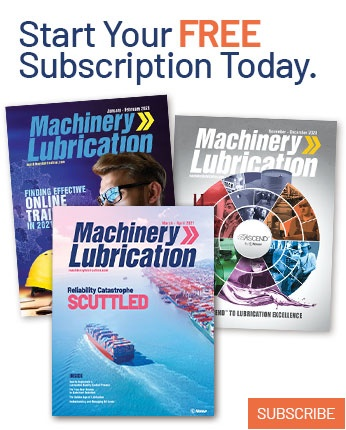 The advancement of new technology enables you to fine-tune your lubrication program. Two such technologies are ultrasound and vibration analysis. How does listening to a bearing in a noisy environment help you with lubrication? How can feeling a bearing with all those other machines chugging along tell you anything? Ultrasound is high-frequency sound that is above the range of normal human hearing. Typical applications for ultrasound include air and gas leak detection; electrical inspections to detect corona, tracking and arching; steam traps; and mechanical inspection of rotating equipment, including condition-based lubrication. Vibration analysis is another technology that can enhance your lube program. It is defined as analysis of vibration monitoring data to track the characteristic changes in rotating machinery caused by imbalance, misalignment, bent shaft, mechanical looseness, faults in gear drives, defects in rolling-element bearings and/or sleeve bearings, or more commonly referred to as the movement of a body about its reference position. There are several advantages of using these technologies. The greatest is the amount of money you can save. Since the bearings are receiving precisely the correct amount of grease, lubrication-related bearing failures will decrease, potentially reducing unscheduled downtime. Less downtime equals more profit. Savings can also be realized in motor and equipment repair costs as well as in decreased lubricant usage. Through the application of these technologies, you can confirm the quantity of grease that a bearing requires for optimal performance. However, be sensitive to experienced craftsmen while proving that overgreasing is a real problem. It is hard to argue that “we do it this way because we have always done it this way” when there is a precision-measuring tool telling you otherwise. Remind these veteran workers that new bearing manufacturers are creating tighter tolerances that require more precise lubrication methods. 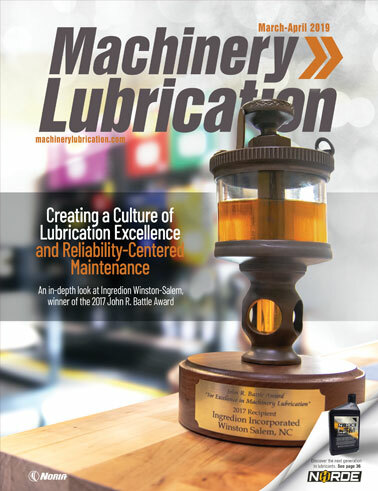 In respect to these new lubrication methods, technicians need to remember the six “Rs” - the right type, right time, right quantity, right place, right way and right condition. The right type of lubricant accounts for the grade, base oil viscosity, additives, pumpability, load, speed and thickener type. When calculating time and quantity, use the formulas mentioned previously. In regards to the right place, you need to ensure that the lubricant can handle the environmental factors it will face, such as moisture, temperature and vibration. The right way of lubricating equipment will be crucial to its longevity. Remember, some grease guns may create extreme pressures that can blow out supply lines and/or seals. The right condition of the lubricant refers to its age, if the base oil has started “bleeding” from the thickener and how clean the grease is entering the component. Just because the grease in the gun is new and clean, don’t forget to make sure the tip of the gun is clean as well as the grease fitting. The more you lubricate a bearing, the greater the chances of introducing particles into it. Once these microscopic particles get into the bearing, they wreak havoc on the precision-machined surfaces. Too much of anything is a bad thing, and you can lubricate something too much. Bearings are designed to operate with a certain amount of grease in them. Put in too much, and they will fail earlier than expected. 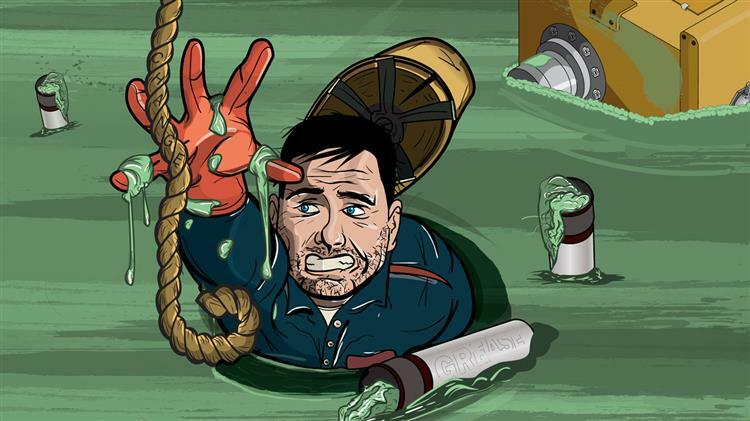 Increasing the life of components, decreasing downtime and being good stewards of the environment by not creating puddles of grease will help the bottom line of any facility, but getting there involves all workers. 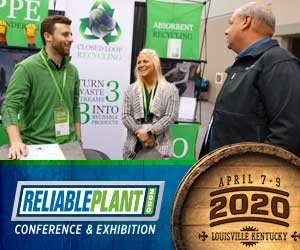 When every employee thinks about reliability to the same degree as others do about safety or cost controls, you will have reached a new level of trustworthy operations. Then, and only then, can leaders or stewards say they have achieved their goal of reliable and safe facilities. This is an ongoing discussion at our mill with maintenance personnel explaining why bearings receive different amounts of grease. It is only through sharing this knowledge that we can start to persevere and attain lubrication excellence.